By LUDWIG VON KOOPA - The investigation also covers PlayStation Network and Xbox Live. Today, the United Kingdom's independent non-ministerial governmental department, the Competition & Markets Authority (CMA) has announced they'll be investigating how the major console manufacturers—Nintendo, Sony, and Microsoft—have constructed their online service contracts. Specifically, the automatic renewal terms and if those break consumer protection laws. If you live in the United Kingdom and you're still alive, you can reach out to the CMA via this link. They're looking for your story. With regards to Nintendo, I'm on record for believing the Nintendo Switch Online automatic renewal terms are absolutely “slimy and scummy”, especially with how you MUST provide your credit card or PayPal information to Nintendo even if you'd rather pay with your existing account balance. When I was writing that Nintendo Switch Online article, I was told by other staffers that this kind of automatic renewal is the norm in this industry, and I should accept it. Well, the United Kingdom government apparently agrees with my view. Not that I enjoy government regulation here. The article where I decried Nintendo's practices (that extend to their console competitors) had market-based ways to make our displeasure known, without a government investigation. Still, those companies do have an obligation to follow the laws of the countries where they do business, so if they are breaking them, then, yes, something should be done about that. It's important to note that the CMA, having just launched the investigation, hasn't made any conclusions yet. They're just fact-finding. There is a decent likelihood that the government will fail to find anything and then never prosecute a case, especially since all the major console manufacturers will have Phoenix Wright, the Ace Attorney, in their counsel as early as next week. 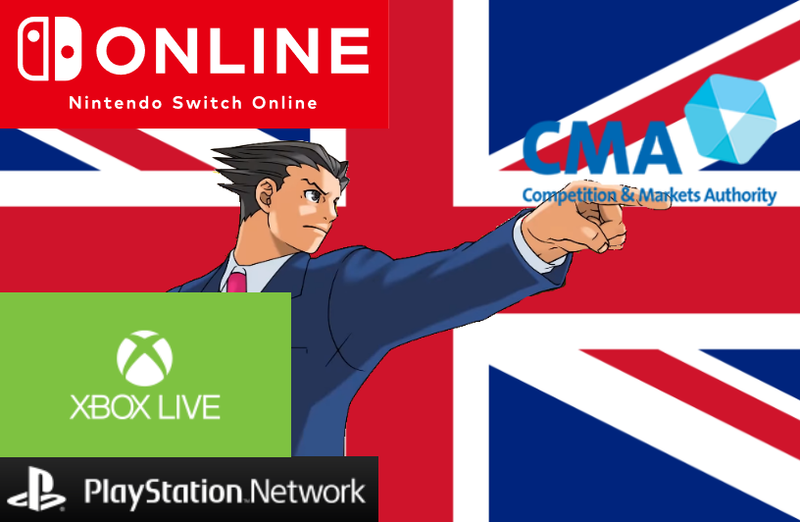 Phoenix Wright's new clients: Nintendo Switch Online, Xbox Live, and PlayStation Network. All fighting the Competition & Markets Authority. Nintendo in particular has a very special, and Smashing, agreement with Mr. Phoenix Wright, so he's going to work hard to defend them. Ludwig would like to see the companies voluntarily not have auto-renewal, because that's predatory and terrible. They can't convince customers that paid online is worth it normally so they have to be underhanded about it. Still, if the government is what's required, then... Anyway, this is KoopaTV's 1600th published article! So, what do you think about all of this? And here is the part where Phoenix Wright joins their counsel.